A quick entry for Correction Corner before we start this week. Rather to my surprise given its excellent teaching reputation, Lancaster University is not, as I stated last week, a member of the Russell Group. Thanks to the several people who contacted me on Twitter to point that out. Bristol council; caused by the resignation of Liberal Democrat councillor Clare Campion-Smith. She had served since 2006, representing Henleaze ward until 2016 and this ward since then. Campion-Smith was Lord Mayor of Bristol in 2015-16, and served twice in the city’s cabinet; a former maths teacher, as cabinet member for children’s services she was instrumental in creating 10,000 new primary school places in Bristol. She was also the Liberal Democrat candidate for the Bristol North West constituency at the 2015 general election. Campion-Smith is standing down on health grounds after being diagnosed with a lung condition. We start the week in the largest city and the cultural centre of the West of England. Westbury-on-Trym and Henleaze ward is an affluent northern suburb of Bristol, about three miles from the city centre. This area arguably predates Bristol: in Saxon times there was a monastery at Westbury-on-Trym. The monastery became a college in the 13th century and was largely destroyed in the Civil War: the Royalist commander Prince Rupert of the Rhine had used it as his headquarters, and when he left he had the buildings set on fire to prevent the Parliamentarians making use of it. The area was mostly developed for housing in the Victorian and inter-war period as Bristol expanded, and is and has always been a favoured area of Bristol’s rich and educated people. Westbury-on-Trym in particular has some of the city’s most expensive housing, and still has the feel of a village which the city has swallowed up. Its list of notable former residents includes the horticulturist John Wedgwood, the Poet Laureate Robert Southey (who wrote his Eclogues here) and the archaeologist Alice Roberts. Future names may well be added to that list: since 1924 the prestigious Badminton girl’s boarding school has been located here, and the list of Old Badmintonians includes the Indian prime minister Indira Gandhi, the film actress Claire Bloom, the novelist Dame Iris Murdoch, the failed Lewisham parliamentary candidate Polly Toynbee and the former Conservative MP for the local Bristol North West constituency, Charlotte Leslie. Leslie is one of those Tory MPs who is no doubt still cursing Theresa May’s decision to go to the country last year: she lost Bristol North West to Labour on a swing of over 9%, a Tory majority of 4,500 being replaced with a Labour lead of the same size. The swing away from the Conservatives last year was most pronounced in young and cosmopolitan areas, but it would be a little misleading to describe Westbury-on-Trym as either of those things. True, the 2011 census did pick up pockets in the ward with high proportions of people born in such exotic locales as Hong Kong, South Korea and Wales, but the first two of those are probably accounted for by Badminton School boarders. We can, however, have more confidence in describing Westbury-on-Trym and Henleaze as being characterised by educated people with high-powered or high-paying jobs: in 2011 this area was covered by two wards, both of which were in the top 100 in England and Wales for people in higher management or professional occupations. The former Henleaze ward came in at number 9 on that list and was also just outside the top 50 for population educated to degree level. Truly this is where Bristol’s educated wealthy professionals live, although generally not the “trendy” ones: they tend to be closer to the city centre in areas like Clifton or Redland. Those two wards may have been similar socially but they were divergent politically. 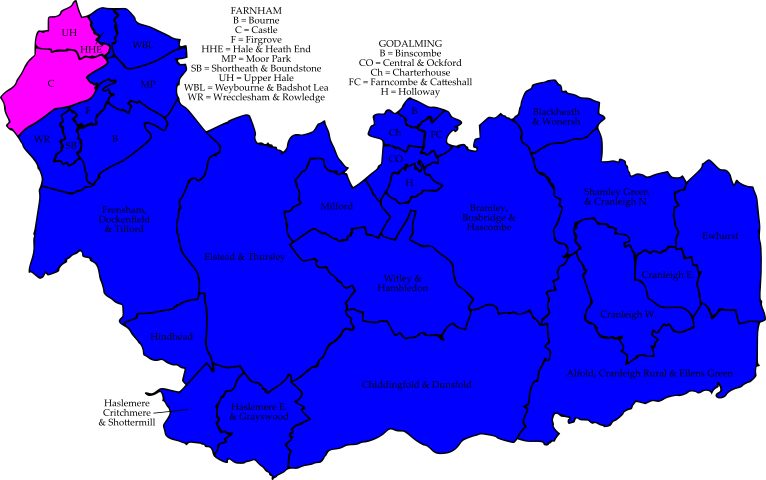 The old Westbury-on-Trym ward was one of the strongest Conservative areas of Bristol, but Henleaze was a longstanding Lib Dem ward: the Tories came close to gaining it in 2009 and 2010, but then fell back. The two were essentially merged into one ward in 2016, and those contrasting political traditions collided to produce a split result: the Conservative slate polled 39% and won two seats, the Lib Dems had 32% and won the third seat, and Labour came in third with 16%. There was a clear personal vote in evidence for the Tories’ Geoff Gollop, who topped the poll: a local accountant – and thus ftting the Westbury-on-Trym stereotype perfectly – he was a long-serving Westbury-on-Trym ward councillor and was Tory candidate for the inaugural Mayor of Bristol election in November 2012. Campion-Smith also clearly had a personal vote: she polled nearly twice the votes of Graham Donald, third on her party’s slate. The Lib Dem seat here is definitely not safe: Campion-Smith had a majority of just 70 votes over the third Conservative candidate. Defending this difficult seat for the Liberal Democrats is the aforementioned Graham Donald, a retired senior civil servant who ended his working career as deputy clerk of the Privy Council. The Conservatives have selected Steve Smith, a GP surgery manager and scout leader on the Brexit wing of the party. The Labour candidate is Teresa Stratford, an occupational therapist. Completing the ballot paper is Ian Moss of the Green Party. I am grateful to Neil Harrison, quiz friend and former Bristol city councillor, for help with this preview. Horsham council, West Sussex; caused by the death of the Chairman of the Council, Conservative councillor Roger Clarke. He had served since winning a by-election in May 2013. We move now to south-east England and to Prince Harry’s new dukedom. This is a ward based on three eponymous parishes roughly halfway between Horsham and the South Downs. Despite the order of the names, the largest of these parishes is actually West Grinstead which takes in the neighbouring village of Partridge Green and the curiously-named Dial Post on the A24 Horsham-Worthing road. West Grinstead is a minor Catholic place of pilgrimage thanks to the Shrine Church of Our Lady of Consolation and St Francis, built in the late nineteenth century and last resting place of the former Salford MP Hilaire Belloc. The Catholic associations don’t end there: Cowfold is home to the only Carthusian monastery built in Britain since the Reformation. This ward is strongly Conservative and not seriously contested by other parties. In 2015 the two-man Tory slate were opposed only by a single Liberal Democrat candidate, who lost 71-29. 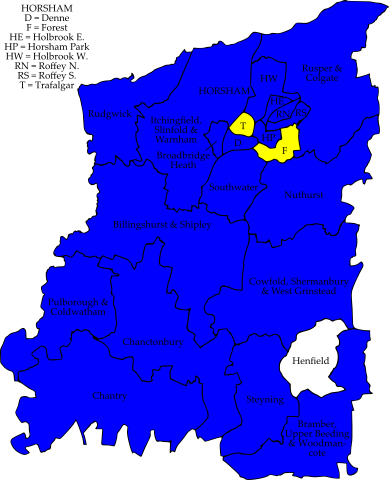 The Tories are also safe in the local county council division (Henfield). Defending for the Conservatives is Lynn Lambert who is the only candidate to live in the ward (in Partridge Green); she is a trustee of the Horsham branch of Age UK. The Lib Dems have selected David Perry, and Labour have thrown their hat into the ring by nominating Kenneth Tyzack. Waverley council, Surrey; caused by the resignation of Farnham Residents councillor John Williamson, who is relocating to the Cotswolds. He had served since 2015. We saw some action from the English Civil War earlier, and such is the case again here in the Surrey town of Farnham. Farnham Castle was for centuries the seat of the Bishops of Winchester – one of its residents was the fifteenth-century Cardinal Henry Beaufort, who presided at the trial of Joan of Arc. The castle was slighted after the Civil War but nonetheless saw military use afterwards: in the Second World War it was a centre for training artists in military camouflage. It’s now used as a training and conference centre, and in 1974 was the venue for the wedding of a South African exile called Thabo Mbeki, who would go on to succeed Nelson Mandela as president of the country. The castle gives its name to a ward which combines Farnham town centre with the village of Dippenhall to the west. Located on South Western Railway’s Alton branch line, Farnham is possibly the archetype of the Surrey commuter town, and its proximity to the Army town of Aldershot (over the border in Hampshire) helped to secure its prosperity. Today Farnham is the largest town in the Waverley local government district – which is named after a ruined abbey, not the Walter Scott novel. Now this ward is politically interesting. It voted strongly Lib Dem in 2003, but the Waverley Lib Dems then fell apart. One of their two Farnham Castle councillors sought re-election as an independent in 2007, splitting the Lib Dem vote and helping the Conservatives to gain the ward. 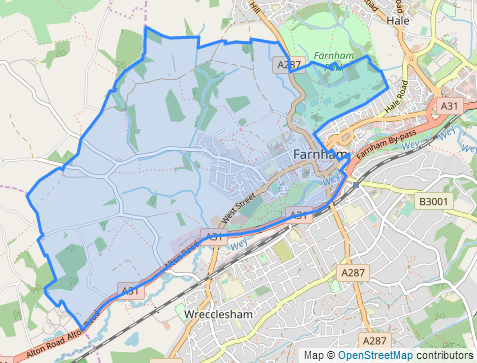 The Tories made Farnham Castle safe in 2011, but then lost both of the ward’s seats to a new localist party called the Farnham Residents, one in 2015 and the other in an August 2016 by-election. That by-election, which I previewed in pages 162-164 of the Andrew’s Previews 2016 book (still available from Amazon! ), actually saw the Tories fall into third place: shares of the vote were 41% for the Farnham Residents, 31% for the Liberal Democrats and 24% for the Conservatives. 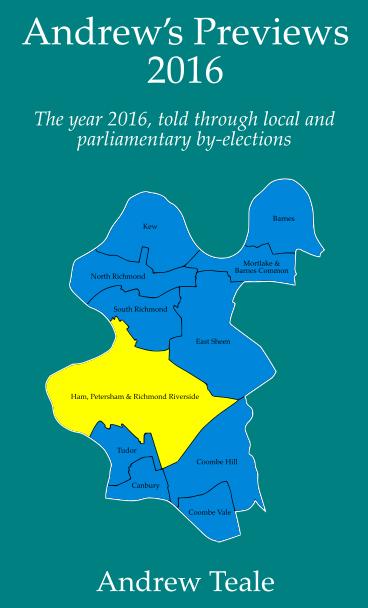 There was a similar result in last year’s county elections in the local division of Farnham Central, which the Farnham Residents gained from the Conservatives. Defending for the Farnham Residents is David Beaman, who works in the transport and haulage industry and won a by-election to Farnham town council two years ago. The Lib Dems have selected textile artist Jo Aylwin. Conservative candidate Rashida Nasir hopes to join her husband Nabeel Nasir on the council. Completing the ballot paper are Labour candidate Rebecca Kaye and independent Mark Westcott. Broadland council, Norfolk; caused by the resignation of Conservative councillor Ian Graham, who was first elected in 2007. Following the death of his wife last year, Graham intends to dedicate more time to charity. As we move from the south-east to the east of England, let’s reflect that there are some wards which just can’t stop having by-elections. This is Andrew’s Previews’ third trip to Aylsham, a town on the River Bure around halfway between Norwich and Cromer. Because of its location Aylsham was a stop on the coaching route, and the coaching Black Boys Inn is one of the town’s oldest buildings; but as with much of Norfolk it was textiles which originally made Aylsham prosperous, as a centre of the linen and worsted industry. To this day Aylsham is a local market town and agricultural centre, and it was one of the first British towns to sign up to the Slow City movement. 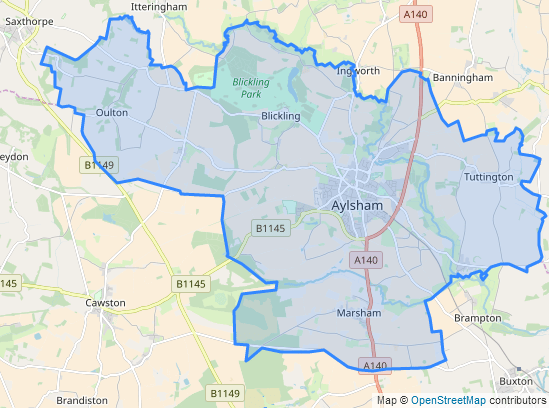 The Aylsham ward isn’t just Aylsham town, as it takes in five other parishes in the area. One of those is Blickling, a major tourist attraction thanks to the Jacobean stately home of Blickling Hall – the birthplace of a royal bride of yesteryear, Anne Boleyn. Now, this is a marginal ward with a complicated political history. 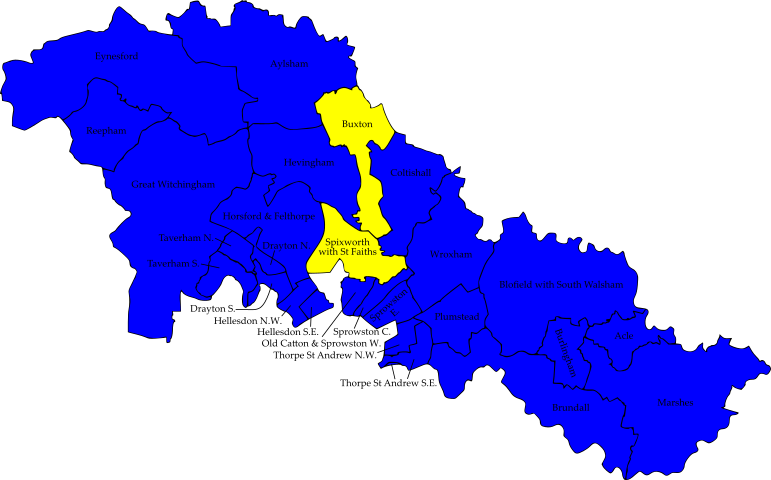 It was created in 2004 when its three seats split two to the Lib Dems and one to the Conservatives. The Tories went up to two seats after the 2007 election, but lost their second seat to the Lib Dems’ Steve Riley in a 2013 by-election following the resignation of Conservative councillor Jo Cottingham. History then repeated itself: the Tories went up to two seats after the 2015 election, but lost their second seat to the Lib Dems’ Steve Riley in a 2016 by-election following the resignation of Conservative councillor Jo Cottingham (who had returned to the council in 2015 by defeating Riley). Shares of the vote in that by-election were 48% for the Lib Dems and 38% for the Conservatives. The Lib Dems also hold the Aylsham county council seat, which covers a wider area, and with this by-election have the chance to hold all three Aylsham ward seats for the first time. The defending Conservative candidate is Hal Turkmen, who will be hoping to make it fourth time lucky after failing to be elected in Aylsham in 2015, the 2016 by-election and the 2017 county election. The Lib Dem candidate is Sue Catchpole, who currently does part-time voluntary work following a varied business career which included running a village post office, setting up a machine manufacturing company and arranging coach tours to France. Completing the ballot paper is Peter Harwood of Labour. North Kesteven council, Lincolnshire; caused by the resignation of Conservative councillor Julia Harrison on health grounds. She had served since 2015. For our second eastern by-election we are in the flatlands of Lincolnshire. The Kirkby la Thorpe and South Kyme ward is a rural ward, covering five parishes immediately to the east of Sleaford; indeed the ward includes Sleaford’s Poets housing estate, which has spilled over the town boundary. This is a ward dotted with mediaeval buildings: Kirkby la Thorpe’s parish church dates from the twelfth century; Kyme Priory, now the parish church of South Kyme, was first attested in 1196; and Kyme Tower is all that’s left of a fourteenth-century castle. Clearly this was a bustling place in time immemorial, and Kirkby la Thorpe parish alone is thought to include the sites of three deserted mediaeval villages. Things have got a bit more sleepy here since, and that goes for the ward’s election results too. 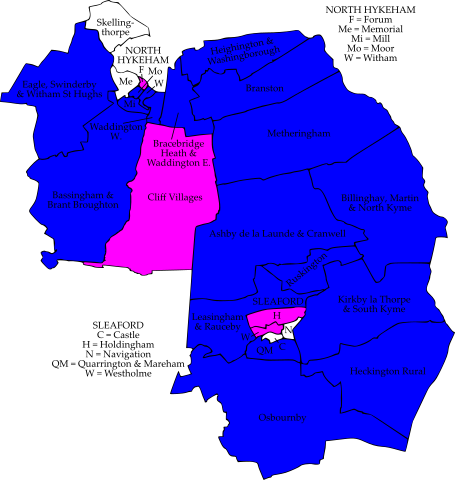 This is a safely Conservative ward which was uncontested in 2007, the first contest on the present boundaries: in 2015 Harrison was elected by defeating the Lincolnshire Independents candidate 64-36. 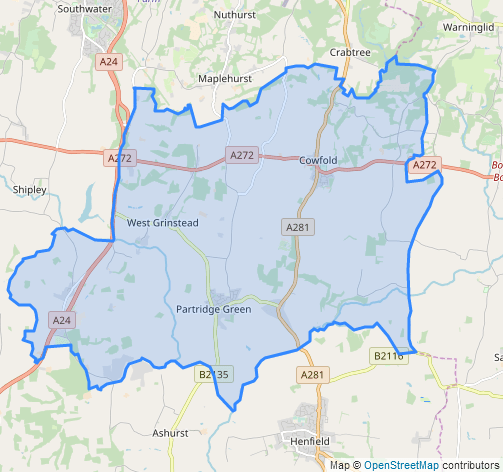 The Conservatives are also not under serious threat in the local county division (Heckington), and in last year’s general election the local MP Caroline Johnson polled 42,245 votes – the highest tally of any Conservative candidate that year. Defending for the Conservatives is Dean Harlow, who lives in the village of Cranwell and is a parish councillor there. The Lincolnshire Independents have nominated Mervyn Head, a South Kyme parish councillor. Also standing are Sue Hislop for the Lib Dems and James Thomas for Labour. 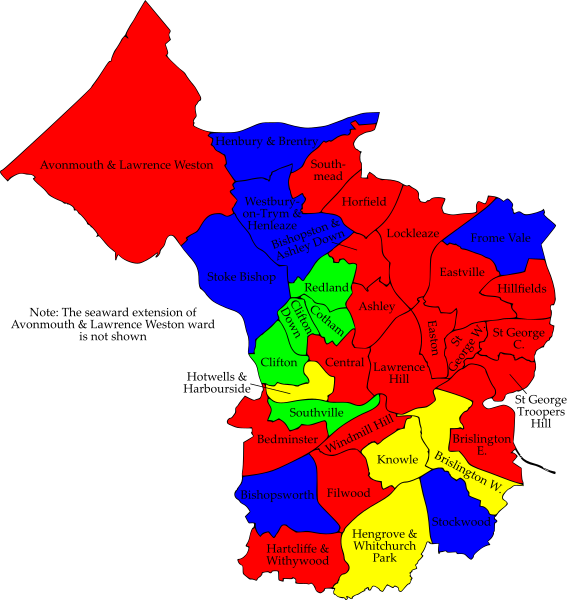 Stockport council, Greater Manchester; postponed from 3rd May due to the death of Maureen Baldwin-Moore, who had been nominated as the Conservative candidate. We finish for today (but not for the week, as there is a poll tomorrow) with the first of a series of five pieces of unfinished business from the 3rd May elections. These are wards where a candidate died between close of nominations and the election, forcing the poll to be cancelled and the election restarted. One of those was a contest to Stockport council. 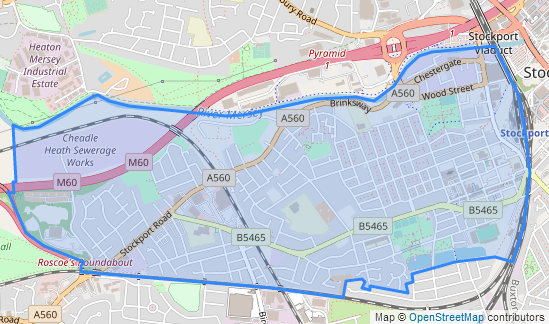 Edgeley and Cheadle Heath ward is essentially the western ward of Stockport proper, bounded by the River Mersey to the north, the Manchester-Crewe railway line to the east and (mostly) the Stockport-Altrincham railway line to the south. Edgeley itself lies in the eastern half of the ward, close to the railway station; it’s a relatvely well-preserved example of a Manchester-area suburb from the Industrial Revolution era, with closely-packed Victorian terracing and miniature Coronation Streets in abundance. Here can be found the home ground of Stockport County FC, whose relegation from the Football League a few years ago ruined one of your columnist’s favourite quiz questions (which league football team plays closest to the River Mersey?). Don’t be fooled by the regular grid nature of Edgeley’s road network; the land drops away very sharply towards the Mersey in the north. To overcome this the Victorian railway builders constructed the landmark Stockport Viaduct, which lies on the ward boundary and consumed 11 million bricks. Transport is important to the economy of this area: as well as the major intercity hub of Stockport railway station, there is a large Stagecoach bus garage here. With the ward’s easy access to Stockport town centre and central Manchester, employment levels are high. To the west is Cheadle Heath, a suburb along the Stockport-Cheadle road. Much of the housing here is of interwar vintage, although it wasn’t always successful. In particular the Gorsey Bank estate, on the banks of the Mersey, turned into one of the most notorious areas in Greater Manchester for crime and anti-social behaviour. Stockport council eventually got rid of those problems by pressing the nuclear button: the Gorsey Bank estate was completely demolished in 1999 and (after a delay) replaced by industrial units. Stockport council presently has a Labour minority administration, and once this result comes in the Labour position should be shored up a bit. This is a safe Labour ward which isn’t under serious threat in this political climate: at the most recent election in 2016 Labour beat UKIP here 68-12. Outgoing Labour councillor Philip Harding is seeking re-election for a seventh term of office: he was first elected in 1999 for the former Davenport ward, transferring to Edgeley ward in 2003 and to this ward following boundary changes the following year. UKIP’s Peter Behan returns after his second place in 2016. Completing the ballot paper are replacement Tory candidate Pat Leck, regular Green candidate Camilla Luff and Oliver Harrison of the Lib Dems.